When you think of food at the pub it’s all deep fried calamari rings, greasy “Insert Pub Name Here” burgers and chicken schnitzels the size of your head. Australia rules for it’s selection of delicious pub meals but healthy alternatives can be a little harder to come by. On average, Australian’s eat out at pubs, clubs, bars or taverns 2.4x per month according to the Ipsos yearly Food CHATs report. You’re more likely to avoid ordering a meal because of health concern although there are plenty of nutritious options available – you just have to find them. Red meat is packed with protein, iron and amino acids; the essentials to maintaining muscle and avoiding fatigue. And, by swapping 8% of your carbohydrate intake for red meat it can help to lower blood pressure. 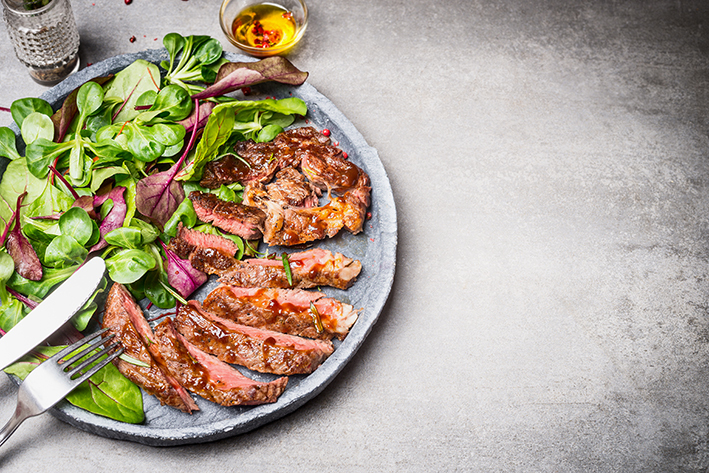 Ditch the fries for a smaller helping of mash, ask for extra salad and go large on the steak. Always go large. Australia loves it’s seafood and that’s a blessing when prawns are high in calcium, potassium, phosphorus and vitamins A and E. Pasta is often overlooked because of it’s dense carbohydrate make-up but choosing spaghettini, or ‘angel hair’, will significantly decrease the calories in a small portion. Hasta la vista spaghetti. The biggest food priority for Australians over 2016 was to eat more fresh fruit and vegetables; so why not go vegetarian in the pub? Picking lasagne will always be a calorie rich meal due it’s delicious cheese sauce but the vegetarian option will heap together a wealth of nutrients from vitamin B1 loaded eggplant, beta-carotene boosting carrot and magnesium high spinach. Boom. A portion of lamb will sure you up with 45% of your daily requirement of zinc, which is essential for a healthy immune system. Undoubtedly you will be tempted with a potato based side but scope out the menu for cous cous instead; it adds a mountain of minerals to your plate. Plus, it’s the only grain so nice that they named it twice.